Music is such a personal thing. The song that ministers to me may bore someone else to tears. I know because they told me so. We’ve covered so many songs here over the past weeks, but only scratched the surface of what music means to people. 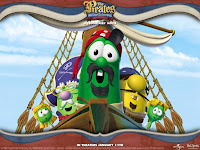 My ringtone is the VeggieTales song, The Pirates Who Don’t Do Anything. It’s true. I don’t like talking on the phone in the normal course of events. I especially don’t like it after I get a string of bad news. So having a ringtone that makes me smile is a must. And darn it, there’s just something joyous and catchy about those Silly Songs. If you are not a connoisseur of this fine group of classics may I suggest a few of my favorites? I could sing an ode of my own to The Water Buffalo Song, or I Love my Lips, or The Song of the Cebu. And let’s not forget His Cheeseburger. Ah, such great memories. There’s nothing quite like letting my hair down and belting out one of these masterpieces. Talk about a stress reducer! And in fact, there are a multitude of studies that prove that listening to music reduces stress. There is also plenty of clinical evidence that shows that laughing is good for us. SO why not combine these two healthy activities into one. I know I connect to my kids in a special way when we giggle and act silly together, and that includes dancing like nuts to VeggieTales. I love that we are building such happy, carefree memories together. Do you have any favorite silly songs? Is it VeggieTale flavored or not? Please share! Well, if I had any other song in my head to suggest, it's gone now. I've been to Boston in the fall by the way. Thanks, Lisa, I think I needed this silly song to get me through the rest of the week! Now confess, Deb. 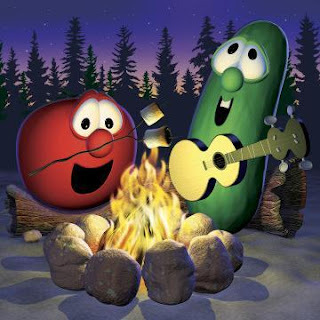 Were you a VeggieTales fan before now? Are you going to get the ringtone for your phone? Do you think Pa grape look' like Cap'n Crunch? Glad we could ease your week, but then, that's what music is for! My favorite Veggie Tales song is the Hairbrush song but since I have no kids in the house, I have to start the DVD collection for the grandchildren. My favorite silly song is HOT DOG HOT DOG HOT DIGGETY DOG on the Mickey Mouse Clubhouse, second is Elmo's Song! Ha! Just finished listening to the hot dog song with the kids before school! I love the Veggie Tales song about the sports utility vehicles, and the one about Santa with the Vikings and the IRS guy. Thanks, Lisa. So much fun. And one of the guys always says: Don't bug me, I'm sleeping. And the other guy says: I'll make you papaya pancakes. This song always takes me to work with a smile. When my son was little, Tim Noah was popular around here, and he had this song called His Name Was Mud. I loved that one, too. Thanks Dina and Suzie for stopping by. I don't think I've ever heard either of those songs, Suzie. But now I want to! Love that song, the kids want to listen to it all the time. I cannot even tell you how many Veggie tale songs I have had stuck in my head!!! IN fact I have some on my ipod. No really, this is true. Ha ha! Veggie Tales. I'm with you on the not-a-phone-talker thing. I'd much rather email or IM. And I love all my daughter's children's songs. There's one called "The Cat Came Back" and it's awesome! Elana, is that Cat song the one where people try to kill the cat? We had that on a CD... And the cat just keeps on comin' back. Super post, Lisa! I am sorta sad that we are moving out of the Veggies at my house, because they're right on and so funny. We listen to their Christmas CDs every year (and "The Star of Christmas" and "The Easter Carol" make me cry like an idiot). I still sing the Cheeseburger Song when we eat burgers. And we sing "Happiness Waits at the Stuff Mart" when we shop at Costco. Sigh, I love Madame Blueberry. T. Anne i cannot tell a lie. I have Silly songs on my iPod too. Just for the kids though. I would never listen to VeggieTales, while I was say, grocery shopping or anything like that. Oh great, Elana now I have to go find The Cat Came Back on iTunes. Sheesh! First you people FORCE me to buy books all the time by making them sound so awesome, and now it's music! Lisa, we're Veggie Tales fans too and we have the Silly Songs with Larry cd :-) The Hairbrush Song is a definite favourite and my kids also like Colin Buchanon's kids cd's (he's an Aussie, not sure if his cd's are available in the US). Thanks, Narelle. Good to know that VeggieTales spans the world! What a fun topic! I love Silly Songs. I'm with Deb on the Hairbrush song. It seems every VT movie has one song that really sticks with me. For the VT Pirate movie, my fav song is Yo Ho hero. Of course if you're going to talk about silly songs, you can't forget Does Your Chewing Gum Lose it's Flavor on the Bed Post Every Night? by Ray Stevens. Oh, and another favorite is The Truck Got Stuck by the Corb Lund Band. I LOVE Veggie Tales songs! My teenagers tried to rewatch a bunch of videos from their childhood when the found out my son's girlfriend had NEVER seen them! But alas, I'd given them all to my youngest sister for her kids. I think the hairbrush song wins for me. I don't know some of the newer ones due to older kids. Oh--and the bunny song. "The bunny, the bunny, oh I love the bunny." Rack, Shack and Benny. Gotta love it! You made me laugh today. What fun! I can't remember any specific Veggie Tale Songs. It's been awhile. I do remember watching Esther though. :)Or was it called something else? Hey Anita, any chance that song could be adapted to fit some of the characters in Washington D.C.? D'Ann, what did I tell ya. Cyclical. VeggieTales always comes back in fashion! Jill, there was a version of the Esther story by VeggieTales. I think it was just called Esther. After the week I've had, this is JUST what I needed! THANK YOU for reminding me. My favorite Veggie songs would have to be "God Is Bigger Than the Boogeyman" and the gratitude song from Madame Blueberry. Ha, Niki! We've taken to calling a certain chain of stores, Stuff Mart. Glad we're not alone. Jen, it doesn't surprise me in the least that you love the Veggies. We are kindred spirits after all! Welcome Guest Blogger Martha Rogers! What If You Have No Words To Pray? What is it About Music? Welcome Steeple Hill Author Merrillee Whren!